How do I access the black HP M175nw cartridge? I can see only one in the compartment. The black colour is finished but the other colours are 50% used. Do I replace the whole thing or can I replace the black toner only in my HP M175nw printer? The HP LaserJet Pro 100 color MFP M175nw printer uses four separate HP 126A toner cartridges so you only have to replace the colour which runs out. Therefore, if you still have 50% toner life in your HP LaserJet M175nw colour cartridges you can just replace the black HP 126A toner on its own. Do you sell imaging drums for my HP LaserJet 100 color MFP M175nw printer? 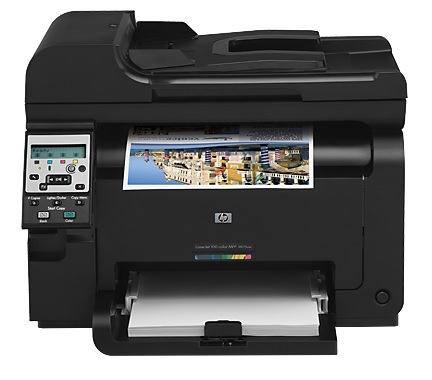 Yes, we stock a genuine HP 126A image drum and a compatible HP 126A image drum for the LaserJet Pro 100 color MFP M175nw printer which are listed on this page under 'Maintenance items'. HP’s smallest colour multifunction printer, the HP LaserJet Pro 100 color MFP M175nw colour laser printer was designed for small offices and homes that want a reliable, easy-to-use all-in-one. The HP LaserJet M175nw all-in-one colour printer is mobile compatible with HP ePrint and Apple AirPrint™ platforms, as well as being wireless and network-ready. The HP LaserJet Pro 100 M175nw multifunction printer is quite compact, measuring 441 x 421 x 338mm and weighing less than 17kg. It’s an attractive machine with a black finish, built-in wireless and Ethernet ports, and a 150-sheet paper capacity. The HP LaserJet 100 MFP M175nw colour laser printer also has a 35-sheet automatic document feeder and a collapsible 50-sheet output bin. The HP LaserJet Pro 100 color MFP M175nw laser printer can print the first monochrome page in less than 16 seconds and the first colour page in less than 28 seconds, followed by a printing speed of up to 17ppm for monochrome and 4ppm for colour. It can copy up to 99 copies and copy reduce / enlarge from 25 to 400 per cent. When operators are using the HP LaserJet Pro 100 color MFP M175nw as a scanner, it can scan at a speed of up to 14ppm and at a resolution of up to 1,200dpi. Outstanding text and graphics quality is guaranteed when the LaserJet Pro 100 M175nw printer uses the original HP 126A cartridges with HP ColorSphere toner technology. A direct printing USB and memory card slot aren't available on the LaserJet M175nw MFP. The Hewlett Packard M-175nw colour laser MFP would also be more user-friendly with a larger display that had touchscreen capabilities.